Gennaro Gattuso was happy with the Coppa Italia victory against Inter as it gave AC Milan some breathing space. 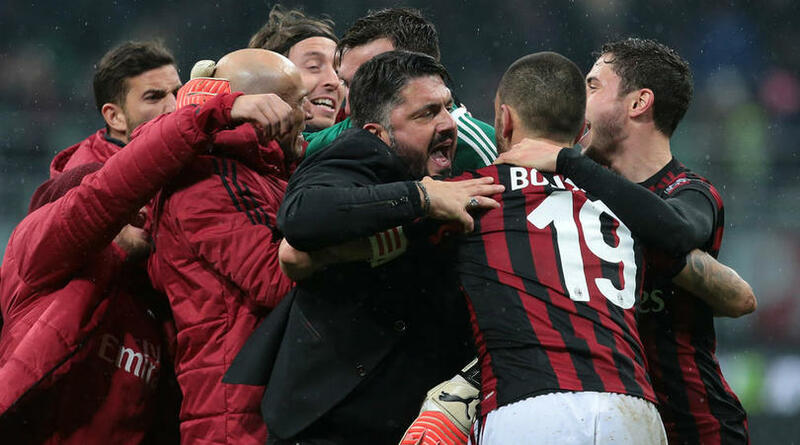 Gennaro Gattuso said "perhaps I am the worst coach in Serie A but I always want to win" as the AC Milan head coach called on his team to prove their derby victory over Inter was not a fluke. Milan advanced to the Coppa Italia semi-finals thanks to a 1-0 win against neighbours Inter after extra time on Wednesday. Teenage sensation Patrick Cutrone was the hero again for struggling Milan, the 19-year-old scoring in the 105th minute to settle the quarter-final fixture at San Siro. Former Milan midfielder Gattuso was happy with the victory as it gave the Rossoneri – 11th in Serie A following just one win in six matches – some breathing space. "Perhaps I am the worst coach in Serie A, but I always want to win, even playing in the garden with my son," he told Rai Sport. "I want my lads to prove that what I saw tonight was not a fluke, then we'll take it one game at a time. "Now there are two difficult games coming up in Serie A and we need points to climb the table. I didn't see much difference between this performance and the defeat to Atalanta. Some might call me crazy for saying that. We had the game with Verona in hand too until we conceded the first goal like dummies. "This is a team that does well until it runs into the first hurdle and today we overcame the hurdles." Gattuso added: "We were coming off a negative period, so this game was fundamental. "I knew from day one what I was going into with the Milan job. It's a big club that won for many years and changed a lot of players recently. We are struggling, but this side has quality and was at times missing that bile. We showed tonight that we can battle it out and then the quality emerges. "I want to compliment all the lads. I won everything as a player, but as a coach I'm well aware that I'm just starting out. I worked in Cyprus, at Pisa, I've been through it all, but I am happy at Milan and the club is planning things very well. "In January I'll turn 40, so I still think like a player, believing that with hunger and a sense of belonging, you can go far. I don't hold back, if I have something to say to someone, I'll say it to their face. There's a lot of work to be done, we'd be hypocrites to say this victory resolves all our problems, but it does give us some breathing room."